In 1890, the Tennessee Confederate Soldiers' Home opened on the grounds of the Hermitage Plantation, former residence of Andrew Jackson. 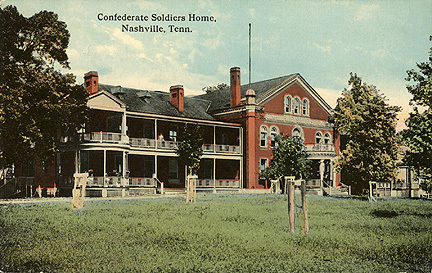 The Soldiers' Home provided care and housing for aging Confederate veterans who resided in Tennessee. Prior to admission into the facility, these veterans submitted applications to a review board. The applications contain questions designed to determine the applicants need and legitimacy for state funded care. In some cases, no application is available, but names and details are listed in one of two ledgers kept by the home. These records are now indexed and available (as Record Group 2) at the Tennessee State Library and Archives. The index is alphabetical by surname, and when available, the applicant's county of residence, military unit, and date of application are included. Most of the index data is taken directly from the applications or the ledgers. However, some data is incomplete or illegible, and supplemental sources were used to create the index entry. These supplemental sources include the two volumes of Tennesseans in the Civil War and additional materials contained in the applicant’s file such as letters of recommendation and verification. Many applicants did not fill out their own forms, but instead relied on third parties who may have misread, misheard, or miswritten pertinent data. Numerous applications give several military units, but the index lists only one. The criteria for this selection are access and legibility. When viewing the applications index, one should be aware of the possibility of the applicant's service in other units. The applications and ledgers contain more information than the index. The forms include questions about the applicant’s families and birth dates. There are also questions concerning enlistment, wounds, and post war occupation. As mentioned previously, many files also include supplemental letters and documents. This information, however, is not consistent on every application. The amount of data available depends on the memory of the applicant, the attentiveness of the recorder, and which of the two application forms were used. The entries in Ledger One have columns with the following information on the soldier: name, date application received, date of birth, place of birth, date of enlistment, rank, company and unit, if the soldier was wounded or captured or released as a prisoner of war, date of discharge, occupation, a date of death, and remarks. Some fields in the columns are not filled in. The entries in Ledger Two are brief paragraphs on the soldier, with some entries more detailed than others. Most of the entries in this ledger give the soldier's name, age at time of admission, unit, dates of admission or discharge from the home, date of death and burial place. Some entries list the name of the individual to be notified in the event of the death of the veteran. Copies of the applications to the Tennessee Confederate Soldiers’ Home can be obtained from the Library and Archives. For ordering instructions, please see the web page for ordering Confederate Soldiers' Home Records.